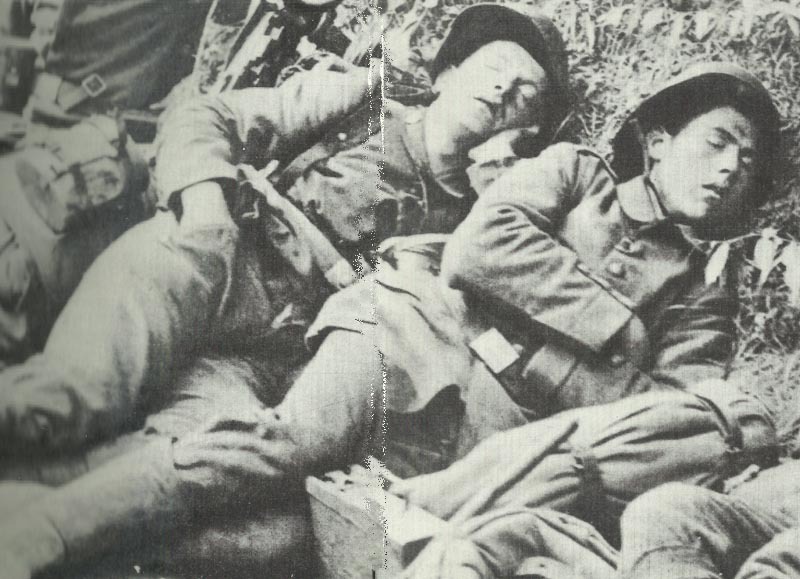 Exhausted soldiers holding a short sleep in the trenches. Battle of the Somme: German counter­-attack fails at Ginchy, British advance east of Guillemont, Rawlinson discusses tanks’ role in forthcoming attack. Brusilov Offensive ,Carpathians: Pflanzer-Baltin sacked from Austrian Seventh Army, Kirchbach replaces. Austrians retreat west of the Gyergyo and Czik valley. Salonika: 6 British detachments demonstrate (161 casualties) along river Struma, further cross-river raids on September 15 and 23. East Africa: British 2nd Division occupies Kidodi and halts with 1,946 of 6,696 men unfit. Belgian Southern Brigade fights at Lulanguru (until September 12) in railway advance on Tabora.